The battle for Edari begins, leaving the colonials of the 443rd Fleet Infantry scrambling in the middle of a massive planetary storm. Trapped with the travorian Corvan and the human prisoner Osborn, Acting Chief Science Officer Elona Zoren tries desperately to salvage her operation. Isolated from the rest of the team, Commander Strakker Tygg finds himself in a fight for survival. Accompanied by Lieutenant Saranus Kron, Captain Landris meets with the Holkari council. Kron makes a surprising ally. While ramping up to producing the first episode of Starcalled, I quickly realized that there is a lot hinging on a show’s pilot. The first episode has to provide, in some form, a complete arc with enough tangible world context to give the audience a sense of the narrative scope. The first episode also determines whether the audience will listen to the second. It’s got to have enough style to get the audience’s attention and enough substance to hook them. When it came time to writing the pilot episode, I felt that it needed to include elements of the reality and the potential of the project — everything the show was committed to representing with hints of everything else the show could develop to be over time. The pilot had to be the perfect whirlwind of everything that makes Starcalled what it is. But, still, I felt like there was something more important to consider before putting words on the page. If the first episode was the audience’s gateway into the rest of the season, the opening scenes — maybe even the opening seconds — of the pilot were the audience’s gateway into the first episode itself. I came to the realization that if the audience is not impressed, curious, surprised, or otherwise hooked in the opening moments of an episode — especially within the first minute of a 40-45 minute affair — then they simply won’t be interested in committing to get to the “good” parts promised to them by the premise of the show. So the opening scene, even the opening second, of the episode — of the entire show — became the target of my intense focus over the course of several drafts. I experimented with opening with narration from Lt. Kron in the form of entries from his officer’s log or personal journal, but felt that this would force me to either commit to representing Kron’s personal thoughts or recaps through the entire series, thereby putting more of the series’ focus on Kron; commit to representing the personal journals of other characters, thereby creating a method of directly communicating character motivation, purpose, and emotion to the audience rather than leave it to interpretation in-narrative; or drop it after some amount of time. Ultimately I decided that, in the opening seconds of the episode, the audience would hear a solo variation of the show’s opening theme which would then transition into an action sequence in medias res and continue at a high tension level until the proper opening theme song kicked in. This conceptual approach helped me guide the writing tremendously, and guaranteed an opportunity to showcase the core principles of Starcalled — exciting musical pieces underscoring dramatic sci-fi action sequences. When designing Starcalled, we knew that humans would be a rare if not extinct species within the universe, meaning that the show would have to be carried primarily by its alien characters. Deciding which species to include in the first season of Starcalled was a relatively simple process. Based on the identities of the central characters — Kron, Elona, Oddie, Rider, Corvan and Osborn — we were able to see which of the many alien races would already be introduced and included by necessity. Beyond creating the characters, the bigger challenge we faced was creating vocal identities for the races and deciding how to portray them. When approaching the colonials, it was understood that the primary series focus for the audience would be on this particular species — most of our show is about colonials and the galactic influence of the Colony. We decided to go with a neutral cadenced, “natural” American accent for them, feeling that coordinating an alien voicing between 10+ people would not only be difficult to maintain across a range of acting experience, but potentially be profoundly irritating for 6+ hours of the show. Giving the colonials a “natural” accent gave the actors a lot of performance latitude to interpret their characters, and gave us the liberty to explore more alien options for the other characters and races without creating an additional emotional barrier between the audience and the colonials. In-universe, we thought that since the colonials are the lens through which the audience views the world of Starcalled, that the concept would be that the audience is interpreting a “direct” translation from the universal translator probes the colonials use. Conceptually, the colonial voices we hear in the show are clear because we the audience are attuned to hearing translated colonial speech. The Zaridians were more of an experiment — being utterly reptilian aliens, we tested a lot of voices that accurately conveyed the their bestial side, but failed to communicate the developmental sophistication of a space-faring species. Eventually, we settled on an elevated American Southwestern accent. While such an accent always runs the risk of stretching into parody, we felt it was a nod to our home state of Texas and would quickly communicate that the zaridians were a roguish race of outlaws, mercenaries, and bounty hunters working on the fringe of a civilization. In the studio, we encouraged actors to move their entire bodies in serpentine fashions, in order to inform their performances. The development and emergence of virtual, artificial, and synthetic intelligence is a quiet thread which weaves through Starcalled. Rider was always designed to be a unique character within the Starcalled universe, but needed a foil — a robotic frame of reference for her… less than robotic tendencies. Larus, the mysteriously ubiquitous virtual interface, was recorded a single line at a time, modulated, then edited together to create a lifeless imitation of a voice. After recording the initial palette of lines for Larus, we wrote future episodes to either directly include the same Larus quotes or include only minimal changes to really emphasize the limited cognitive nature of the program. Rider, on the other hand, was recorded in full sentences at a time to retain a nearly organic delivery to the lines, but with an added element of amelodic intonations in the performance. The end result gives Rider a sense of insurmountable emotional detachment with frightening glimpses of humanity somewhere deep within. Knowing that the travorians would be a heavily modulated, easily identifiable species to voice, we decided to focus on getting a steady cadence, a consistent and purposeful musicality, and stoic brevity in the deliveries specifically to characterize Corvan as a pensive, reserved, but formidable character in the Starcalled roster. It was important to keep the performances on the subtle side, so that Corvan’s more emotional moments would be more impactful, but also to prevent the effects from obfuscating the line deliveries too much. And finally, we knew that the first human character we met would have to make an impact as they represented the most relatable species to the audience. In developing Osborn’s voice, we workshopped our way into a vaguely New England-y accent to give the suggestion of Osborn as an everyman with a limit and also to contrast his voice against the drawls of the zaridians. Two exciting announcements from behind the scenes here at the studio — we’ve updated our storefront and our Patreon is officially live! We’re pretty excited to add 5 new designs to the store including unit insignias (and two alternate designs) for the 443rd Colonial Fleet Infantry and the Terran Navy’s 19th Starfighter Regiment as well as a poster design teasing the first season of Starcalled. New designs coming soon, so stay tuned! On our Patreon, all patrons will not only receive 10% off any order in our store, but will receive weekly production updates and lore entries from the Starcalled universe. 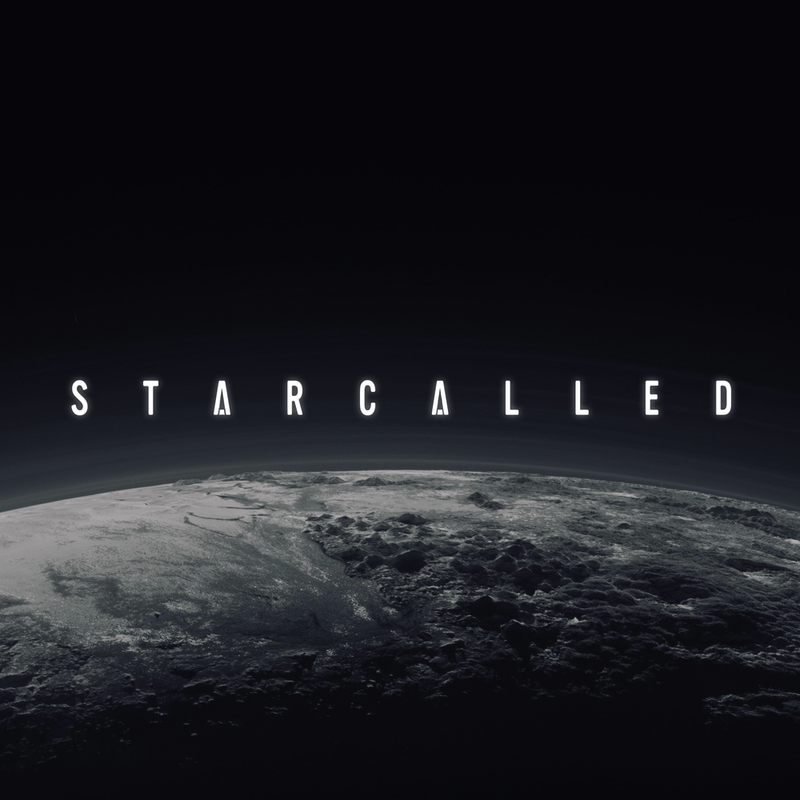 Patrons at higher tiers gain access to exclusive scripts, deleted scenes, music previews, and community stretch goal rewards including a Patreon-exclusive mini-series and production companion podcast breaking down the process of producing Starcalled. In our notes from the studio, production on the back half of the first season is well underway — we’ve started recording vocal performances for episodes 5 and 6 and we think you’re going to like what you hear. In the meantime, enjoy this preview of lore we’ll be sending to our Patrons in the future. Don’t tell them you saw this! It must've been January 2016 when we finished the original pilot episode of Starcalled, a show idea which had been gestating by that point for several years prior. It was twenty-something minutes long and packed full of explosive sound effects and twenty-something minutes of bombastic music that I sort of stumbled through for a few weeks. I'd never really composed music before that point, but I knew enough music theory and assumed I'd just sort of figure it out along the way. I've always held a very passionate love for film scores. As a kid, I would sit down and listen to the Batman Returns soundtrack on repeat, imagining all the sorts of adventures Batman would have as the music dictated. Because the music did dictate the story. And I think that's a lot of what drew me into that world -- the capacity of music to serve as a guide and story teller. What does it make us feel? What can it make us see? By the time I got my hands on the Star Wars soundtracks, it was over. I knew I wanted to be that kind of creator. But years passed, and opportunities don't just show up. So I made my own through Starcalled. Going into the first iteration of the story I knew two things: (1) the music was the spine of the series and (2) there wouldn't be a narrator. I knew there was no conceivable way any story I wrote or produced would have a narrator weighing down every scene with exposition or telling us how characters feel internally or whatever other problems were discussed then. Which was all fine, mostly. The problem with entrenching yourself firmly against including a narrator is you then commit yourself to having characters use dialogue to facilitate action and discovery or just losing the action entirely. And when you're trying to make an action adventure show with spaceships and aliens doing cool action-y things in space? You course correct. And so with the first pilot successfully on tape -- with decent music, sound effects, and most importantly no narrator -- we immediately hit a wall with production. I was frustrated with the scope of the concept and the execution. I had written 3 or 4 episodes ahead, but I wasn't happy with what was coming out. It just wasn't enough. So the entire series went on hold so it could get redeveloped into something else. Something more compelling. More sophisticated. More mature. The writing needed to be better. The music needed to be better. Gradually, the entire project got shifted to the back burner as I struggled to find my way forward. It wasn't until Daredevil first came out on Netflix that I had a revelation about the how of the show. Noting the irony of a blind audience not being able to fully access a show about a blind protagonist, they started rolling out audio description tracks. A narrator filling in the details by explaining action and reaction -- keeping the pace of a television show but letting the narration set the stage for the sound effects, the music, and the sound of acting. As a creator, it was a paradigm shift. So, I added a narrator. To prime the audience for the action. To guide the audience through the music because I still knew one thing about Starcalled -- the music was the spine of the series. As to the what of the show, it wasn't until I finally (read: with great reluctance, etc) started watching Game of Thrones that I realized what to do with the story: take the characters back to the real starts of the journeys and let them grow into the characters I actually want them to be. That the story eventually needs them to be. It took a couple of years of reflecting and growing apart from the project, but it was necessary and important. And, now, that brings us here. The new iteration -- revision if you like -- of Starcalled is progressing well into production on its first season. Out of five, hopefully. Stay tuned. We'll talk again soon.